Last year we took a look at the third arc of the light novel series Sword Art Online (which is getting an anime adaptation later this year); but as enjoyable as that was, it is nothing compared to the heartbreaking, beautiful tale that follows it: Mother's Rosario. On the whole, Sword Art Online is a series of action adventures. The first arc is a death game story. The second is your typical rescue-the-princess fare while the third is a cyber murder mystery. But Mother's Rosario is completely different in scope and tone from everything that comes before it. Rather than dealing with a brand new adventure in a new and different virtual reality MMORPG, Mother's Rosario focuses on the lingering aftereffects of spending over two years in a life-and-death game world. The minors who survived Sword Art Online have largely been corralled into one school. There, they have the support of teachers and mental help professionals who have all volunteered to help them re-acclimate to the real world and catch up on their several years of missing school work while surrounded by the only other people in the world able to truly empathize with what they have been through. In this setting, the characters begin to move on from their death-game experience and start searching for what they want to do with their lives. Another aspect that sets Mother's Rosario apart from the rest of Sword Art Online is the almost complete absence of Kirito, the series' main protagonist. In fact, Mother's Rosario is the first book in the series in which Kirito is never a viewpoint character. Rather, this novel is told exclusively from Asuna's point of view. This is an excellent choice as it allows Asuna, who suddenly went from strong female lead to weak damsel in distress in the series' second arc, to once again come into her own and develop as a character. Asuna finds that she feels more at home in the recreated Sword Art Online than in the real world. For two years in the online world, she was a warrior in charge of her own destiny and helped lead others in their fight for freedom. In the real world she's the heiress to a rich and distinguished family full of CEOs and politicians and is thus expected to go to the best schools, get the best grades, get a highly respected job, and marry an influential high-society man—her whole life has been planned out for her since birth. There is no room in the plan for spending time in an online game with her friends, going to a non-top tier school, or loving a normal boy. Thus, much of Mother's Rosario is Asuna's struggle with who she is and who she wants to be as she is pitted against her overbearing, intolerant mother at home. While Kirito is little more than a supporting character in Mother's Rosario, the novel does a decent job at proving the old maxim “there's always someone better.” In this case, this is personified by the new character Yuuki, the “Absolute Sword.” Despite not having any special skills like Kirito's dual wielding ability, she proves herself superior in both speed and technique. As Kirito often seems overpowered in the series, it is interesting to see that, while strong, he is far from unbeatable. 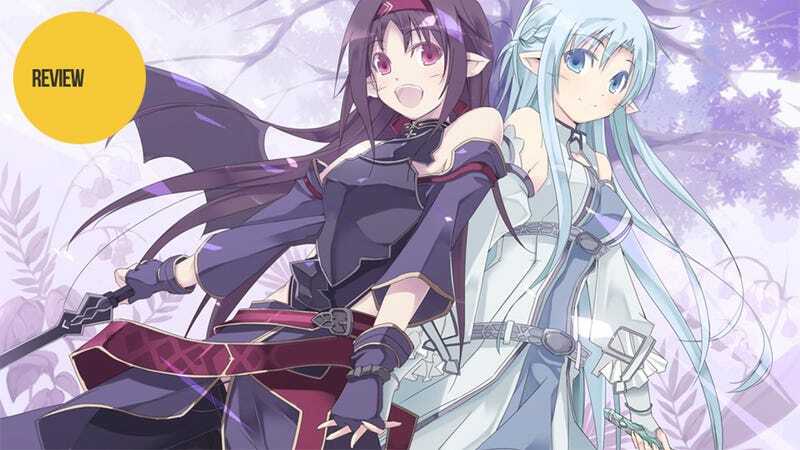 On the virtual world side of the story, Mother's Rosario is about Asuna meeting Yuuki and joining her group of similarly skilled players in attempting what should be impossible—beating a raid boss with just seven people—before the guild members go their separate ways. Of course, at the heart of the story is a secret—the reason for the guild’s impending dissolution and the background behind Yuuki's amazing skills. And it is a secret that will make even the most jaded heart weep. The NerveGear and AmuSphere, the VR helmets in Sword Art Online, are amazing pieces of technology. By connecting directly with your brain, they allow all five of your senses to be replicated in a virtual world. Of course, there are more than a few other possible uses for such technology than just video games. Mother's Rosario explores a few of these uses—namely, the medical ones. As the VR helmets disconnect your mind from your body, sending the signals from your brain directly to the VR world, similar devices could be used as anesthesia. Patients in chronic excruciating pain could escape it and, as is the case in the novel, live on free of pain in a virtual world—even in the last days of a terminal disease. However, as we see in Mother's Rosario, VR worlds aren't the only option. Through the use of 360-degree cameras, a bedridden person could go outside—seemingly riding on another person's shoulder. All in all, it is an interesting look at the implications of VR technology in this near-future world. When it comes down to it, Mother's Rosario is an enjoyable change of pace in the Sword Art Online series. Instead of focusing on adventure, it focuses on character development for Asuna and explores life after spending two full years in a death game. Moreover, it fleshes out the technology of the world and ties everything together with a heartbreaking story. Simply put, Mother's Rosario is an excellent addition to the overall narrative and should not be skipped. Sword Art Online: Mother's Rosario was released on April 11, 2011, in Japan.